CBD REPORT – JANUARY TO SEPT.
We remain thankful that the Sol Plaatje Municipality who continues to sweep the CBD twice a day and early in the morning the streets are clean. By mid morning it is disappointing to see the litter in the streets and unfortunately after the shut-down where many bins were destroyed it has not made the situation better. We are currently paying attention to placing new bins. Two years ago we launched the Adopt a Pavement campaign and although it is difficult to get every business to participate we are proud of those businesses who have kept up their commitment. It is also encouraging to see that many businesses also remove the weeds and grass along their pavements. With the co-operation of the Business Manager, street signs have been erected in the CBD which was long overdue. With the assistance of the Security of Sol Plaatje many of the areas in front of businesses have been cleared from sleeping areas at night which left the areas in a terrible state. The Woolworths corner still remains a major problem. Investigation is being done of Commercial buildings that are being occupied for residential use. Via the networking to our members, we are supporting the DFA program of “ We Build this City”. A meeting with the Traffic Chief is scheduled for Thursday regarding the parking next to the Post Office and time delays in the light of the motor vehicle licences to be renewed at the Post Office. Regular contact with the Police and attention to crime. We have had no response from any Department to erect cameras in the CBD and this will be the first priority of the CID board. This matter has also on numerous occasions being discussed with SAPS, Premiers office and Safety and Security. Garbage bags are handed out to car washers to assist with keeping their areas clean. We are also busy trying to arrange an appointment with ACSA regarding the drop of zone at the Kimberley Airport as this has become a major problem for disabled and visitors. 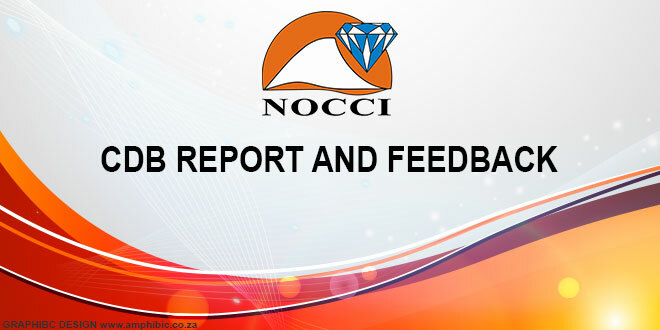 NOCCI has also sent a letter to NERSA and awaiting feedback regarding tariff structures and have invited them to do a presentation to NOCCI. NOCCI as the “ Voice of Business” in Kimberley and the Northern Cape would like to inform our Members that we are very disturbed at the Situation at the Sol Plaatje Municipality and that it is seen that the Interest in our City and toward our Ratepayers clearly is NOT of interest to the Municipality. The fact that the City is in the worst state ever and that Businesses are all threatening to close shop and leave Kimberley is very disturbing. There is no service delivery at present and as a Capital of the City how do we even think of bringing Investment into this City that looks the way it does. The daily calls received by Business regarding the state of the City is overwhelming. We would like to assure all our members that we do understand the frustrations and that we are doing everything possible to try and solve the issues. We have also sent out the New pricing for the NOCCI 2019 Annual Brochure which will be handed out at the AGM in Feb 2019. Members to make use of this opportunity and advertise in our Annual Magazine. Members please make use of your local Chamber and become involved so we can make a difference.